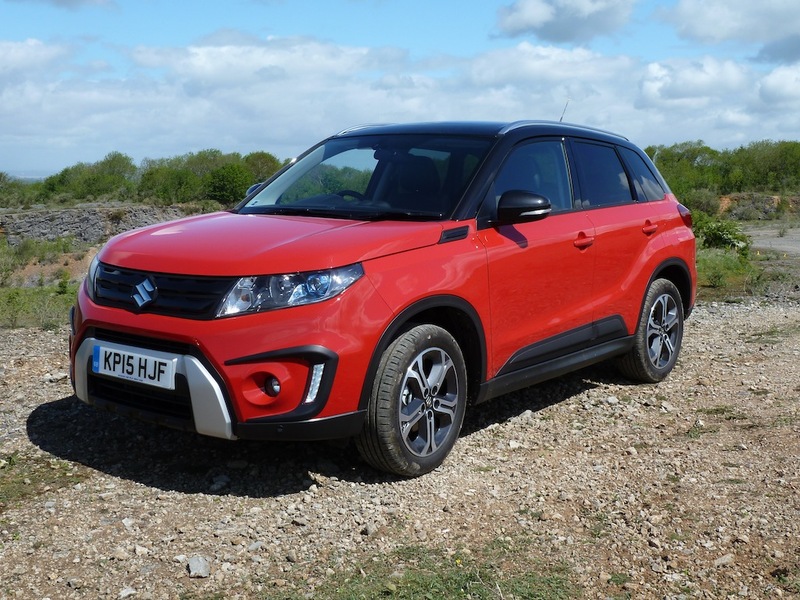 The UK launch of the first Suzuki Vitara took place in the autumn of 1988, and it could justifiably be said that the Vitara was the original compact ‘Sport Utility Vehicle’ (SUV). (In fact the early models have now attained something approaching cult status, and are highly valued by enthusiasts today). However, in fact the origins of the model date back even further, to 1970 when the company introduced the ‘Lightweight Jimny (LJ) 4×4’. This was necessarily tiny, as in order to comply with the Japanese legal definition of a ‘small’ vehicle, it had to be less than 3.2 metres (about 10 feet 6 inches) in length, and was also required to have an engine with a capacity smaller than 360cc. The intention with this model was to provide a compact, affordable ‘leisure’ vehicle with genuinely effective all-terrain capabilities. This brings us neatly on to the latest in the long line of well-respected Vitaras, which still offer buyers affordable competence, both on and off road, within a highly practical package. The new Vitaras – all of which have five doors – have a distinctive compact SUV style appearance, and are shorter, taller and wider than Suzuki’s popular S-Cross models. The background to the introduction of the latest Vitaras (all built in Hungary) includes the important fact that the ‘crossover’ market represents approximately 10 per cent of the U.K.’s new car sales. In case you are wondering what a ‘crossover’ is, essentially it combines the main attributes of Sport Utility Vehicles (SUVs) with those of ‘normal’ passenger cars – especially hatchbacks/estate cars. The new Vitaras (all of which benefit from weight-saving measures including the extensive use of high-tensile steel) are offered with one of three trim levels (SZ4, SZ-T and SZ5), and a choice of two engines. The first is a four cylinder 1.6 litre unit (Euro 6 compliant for emissions purposes), developing 120 PS plus 156 Nm (115 lb.ft.) of torque, and driving the front wheels through a five speed manual gearbox or a new, sophisticated six speed automatic transmission. The automatic versions feature steering column mounted paddles for gearchanging in manual mode. The top of the line SZ5 can be ordered with Suzuki’s versatile and effective ALLGRIP four wheel drive technology. Depending on the model, the petrol engine has a CO2 emissions rating as low as 123 grams per kilometre, and overall ‘real life’ fuel consumption should be not far off 50 miles per gallon. Much work has been done by Suzuki to reduce friction and component weight in this engine, to optimise power, torque and fuel consumption. 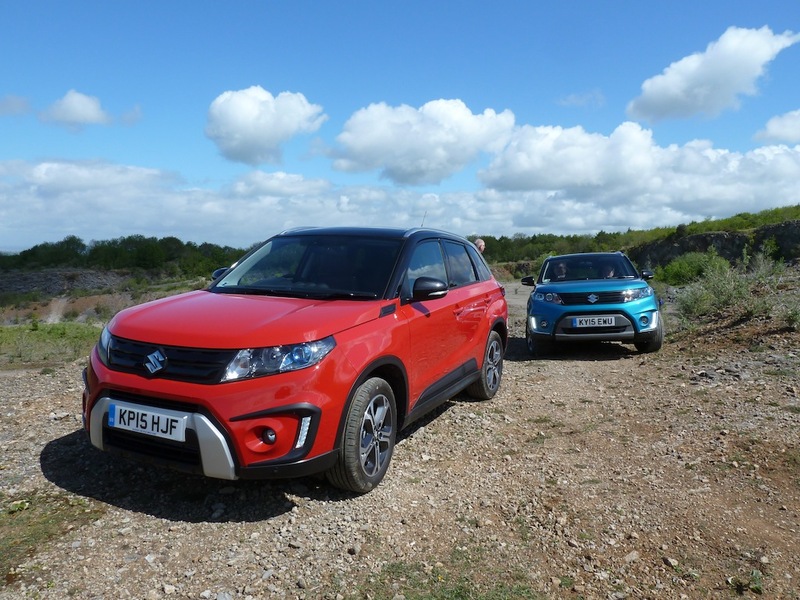 Alternatively, buyers can opt for Suzuki’s four cylinder 1.6 litre DDiS motor – also producing 120 PS, but in this case with a particularly impressive torque output of 320 Nm (236 lb.ft.) at just 1,750 rpm. This engine drives the front wheels through a six speed manual gearbox and, again, in range topping SZ5 versions, buyers are provided with the option of the company’s ‘ALLGRIP’ four wheel drive system. With both petrol and diesel versions, this clever system assesses the vehicle’s progress and automatically feeds torque to the rear wheels if it senses wheel spin at the front wheels. Importantly, the technology controls the vehicle to prevent grip being lost (rather than reacting AFTER this situation has occurred), thereby improving stability. 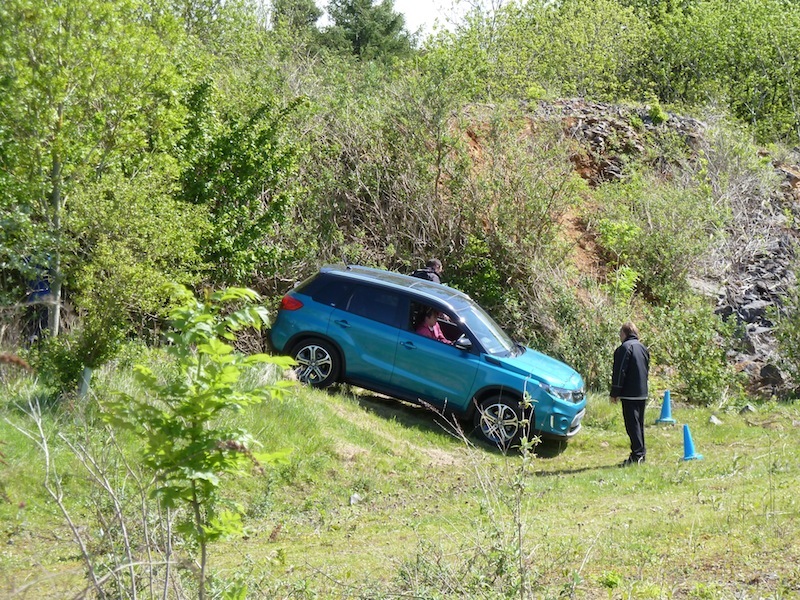 The ALLGRIP set-up features four selectable drive modes, ‘Auto’, ‘Sport’, ‘Snow’ (for any slippery surface) and ‘Lock’ (which engages the vehicle’s limited slip differential to help extricate the vehicle from particularly difficult ground conditions). The Euro 6 compliant diesel motor employs a new Exhaust Gas Recirculation (EGR) system and an electronically-controlled Variable Geometry Turbocharger (VGT), aiding power, torque and emissions. 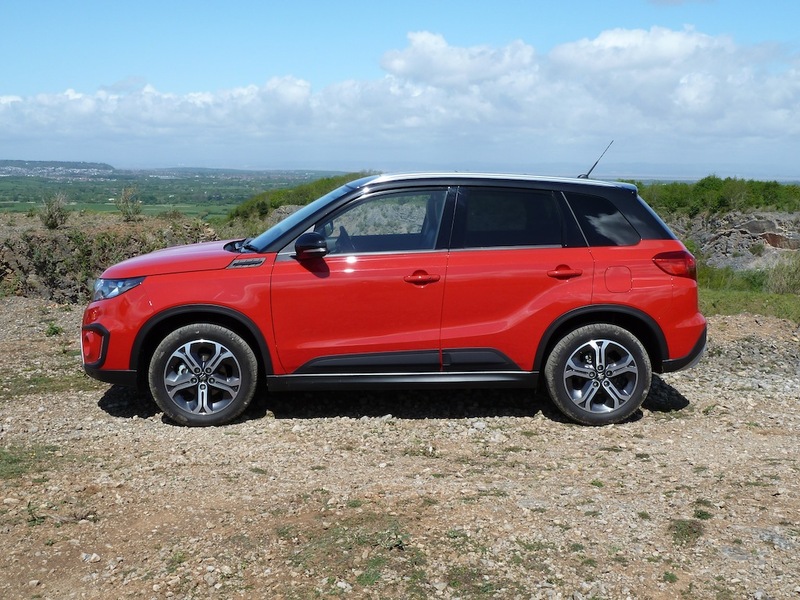 The diesel models have CO2 emissions figures from 106 grams per kilometre for the two wheel drive version, and 111 grams per kilometre for the SZ5 ALLGRIP all wheel drive variant – making this Vitara the lowest emitting non-hybrid four wheel drive vehicle available in Britain. The official ‘Combined’ fuel consumption figures vary slightly according to specific version, but are between 67.2 and 70.6 miles per gallon. In normal motoring this should translate into true life figures approaching 65 miles per gallon. For the new models, improvements have been made to the suspension and braking systems, and the interval between services has been extended to 12,500 miles. 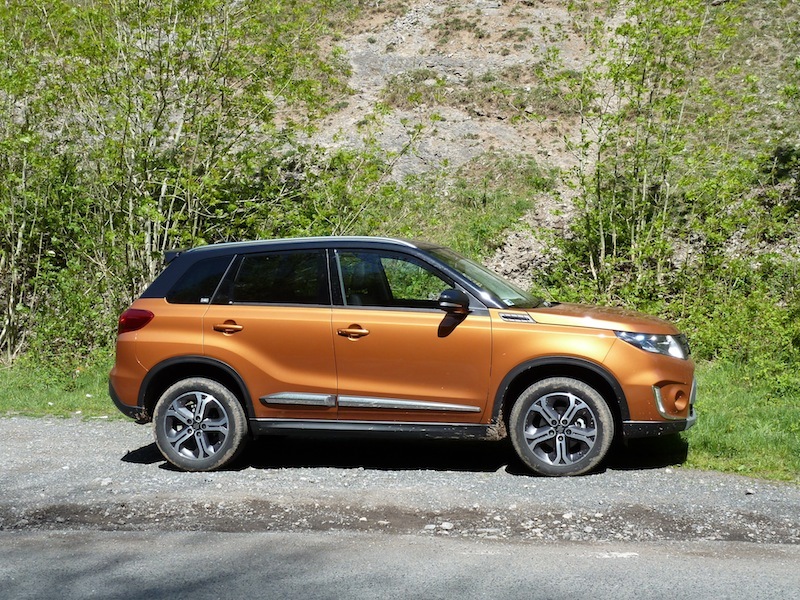 Safety has been taken very seriously, and the Vitara is the first vehicle of its type under 2015 criteria to be awarded five stars under the Euro NCAP (‘European New Car Assessment Programme’) rating system. Among its features in this area are seven standard-fit airbags (including one protecting the driver’s knees). Equipment levels are high, and include (for example), on all versions, an Auto Stop Start system (to stop the engine when the car is at a halt, to save fuel and emissions), ‘Hill Hold Control’ (to aid hill starts), DAB Radio with USB and Bluetooth connectivity, electrically operated front and rear windows, automatic air conditioning, a cruise control system incorporating a speed limiter, plus roof rails and aluminium alloy wheels. On SZ-T and SZ5 versions, Smartphone link audio and navigation is a standard fitting. The SZ-T features 17 inch silver-painted aluminium alloy wheels and privacy glass for rear seat occupants. Additional equipment on the range-topping SZ5 models includes Radar Brake Support (employing milliwave radar to minimise collision risk), Adaptive Cruise Control (which monitors how close the Suzuki is to the vehicle ahead of it, and reacts accordingly), ‘Hill Descent Control’, a double sliding panoramic sun roof, suede upholstery, keyless entry plus push-button starting, LED projector headlamps and 17 inch polished aluminium alloy wheels. Pricing is competitive. For petrol versions the entry-level SZ4 comes in at £13,999, the mid-range SZ-T costs £15,499 and the SZ5 is priced at £17,999 (or £19,799 with the SZ5 ALLGRIP four wheel drive system). By contrasts the diesel versions start at £16,999 for the SZ-T model, rising to £19,499 for the two wheel drive SZ5 and to £21,299 for the SZ5 ALLGRIP variant. A range of extra cost personalisation options and option packages is also available. 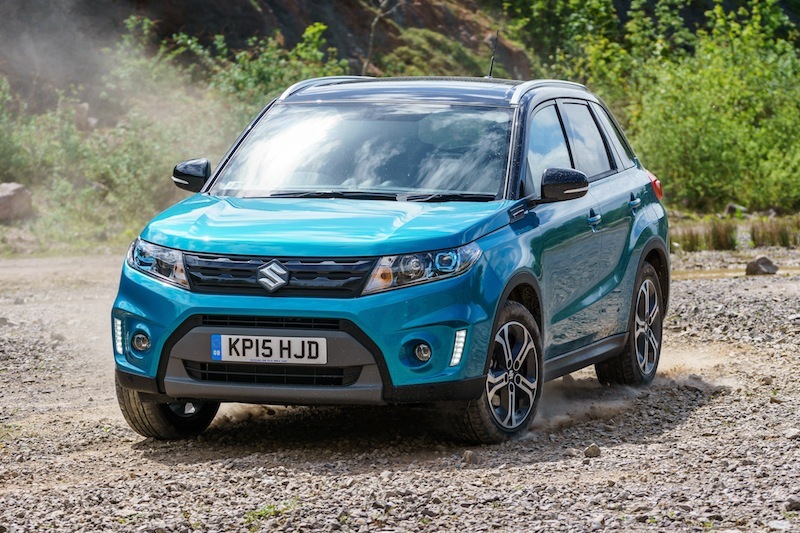 First, my Vitara drive on tarmac… I sampled the range-topper SZ5 version, powered by Suzuki’s 1.6 litre DDiS diesel engine, with a six speed manual gearbox and equipped with the ALLGRIP four wheel drive system. 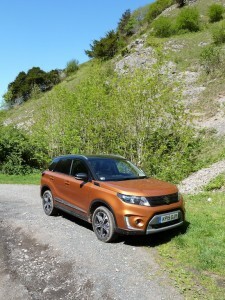 The test vehicle (the orange car with the black roof, in our photographs) also featured the ‘Urban Pack’ of customisation options, costing £500 and including chrome-plated fog lamp bezels, a roof spoiler and body side mouldings. In addition it had two tone paintwork, adding £800 to the price, making a total of £22,599. 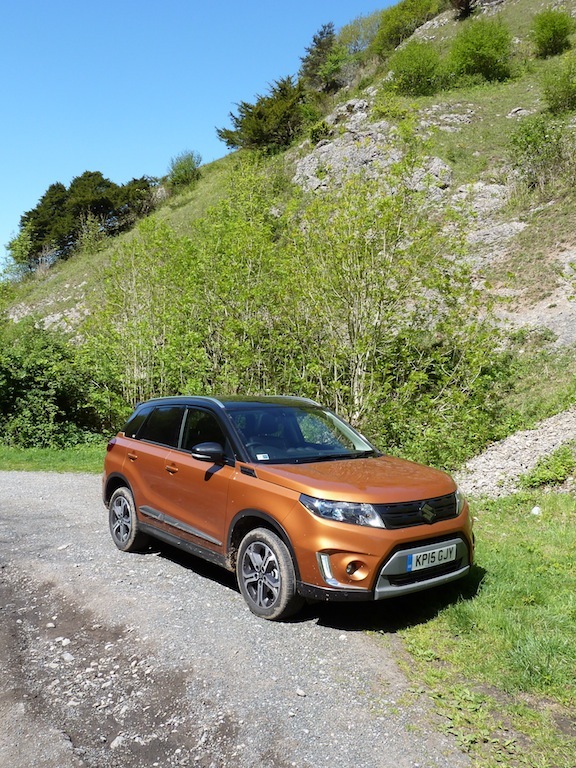 On a varied road route the Vitara was smooth-running, quiet and enjoyable to drive, with spirited performance, terrific pulling power/torque delivery (including from low engine speeds), a slick gearchange and a commendable ride quality. The seats were comfortable too, and I was impressed by the amount of available head and leg room in both the front and rear of the vehicle. I thought too that the spacious luggage compartment was easy to access and sensibly shaped. (In addition, the rear seat and the luggage board can be moved to suit specific requirements for load carrying). 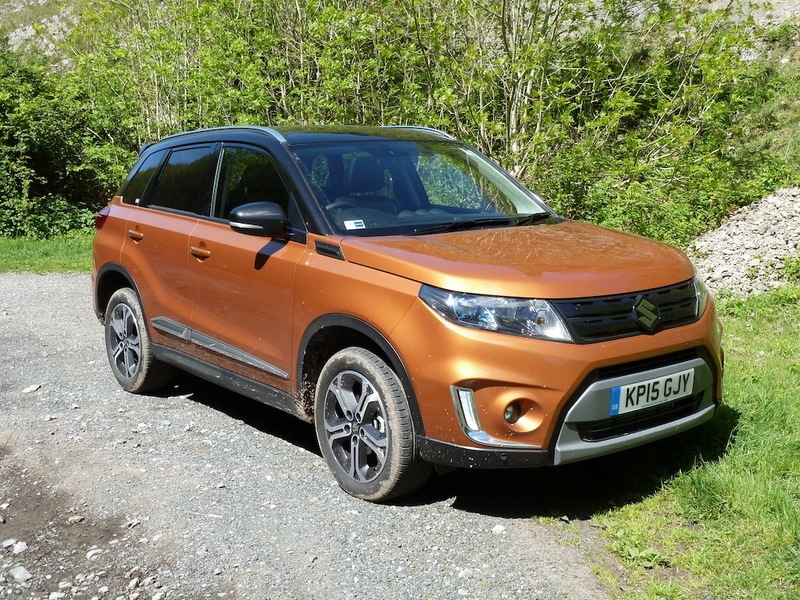 In addition to driving the diesel Vitara SZ5 on tarmac, I was given the opportunity to try a petrol-powered SZ5 ALLGRIP version off road, on a range of surfaces including loose shale, mud and grass, and including some steep gradients both up and down, with ‘difficult’ surfaces. 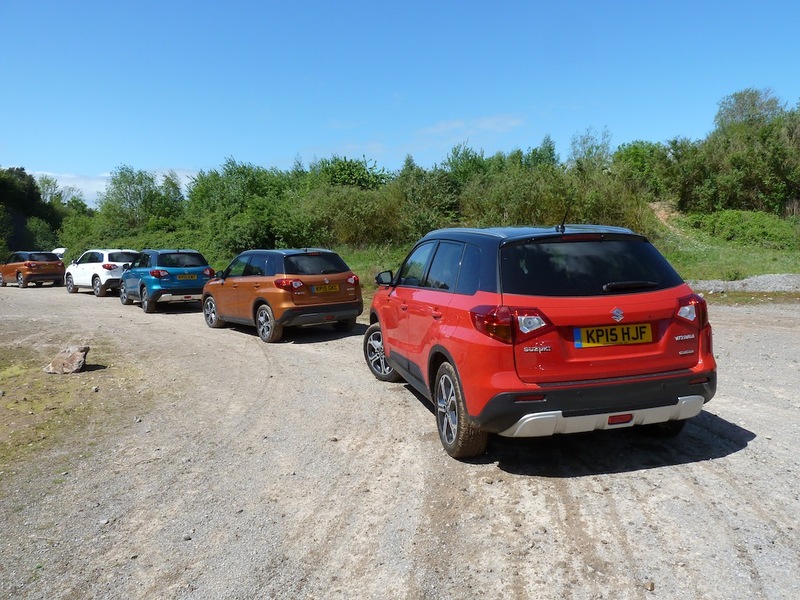 This vehicle (the red one in our photographs) was equipped with Suzuki’s ‘Rugged Pack’ of options, priced at £500 and including front and rear skid plates, black bezels for the fog lamps, body side mouldings and loading edge protection. The Vitaras have deliberately been designed and built to take in their stride steep entry and departure angles on rough terrain, and this aspect proved useful during my test drive. 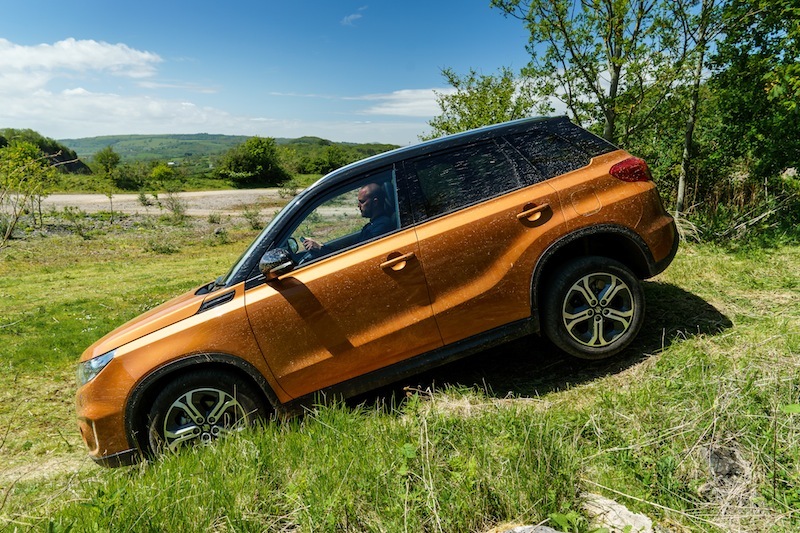 The ALLGRIP four wheel drive system acquitted itself well and at all times the Vitara maintained good progress and felt safe – even over the roughest, steepest sections of the off-road trail. These Vitaras impressed me enormously, both in petrol and diesel forms. I feel that the new models are well-equipped, practical and highly competent machines that also provide excellent fuel consumption (especially the diesel powered versions) and, while not cheap, give buyers good value for their money. For all reasons the latest Vitaras should win many friends among buyers. ‘On the road’ price (not including options): £21,299. Options on test car: Urban Pack, £500; two tone paintwork, £800, making total vehicle price £22,599. ‘On the road’ price (not including options): £19,799. Options on test car: Rugged Pack, £500; two tone paintwork £800, making total vehicle price £21,099.